Glee Review: Take This, Dina Lohan! 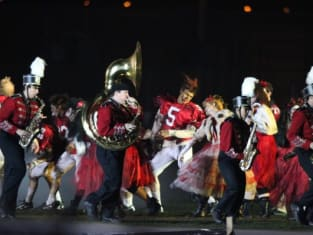 Despite the expensive price tag and the endless hype for "The Sue Sylvester Bowl Shuffle," producers insisted: this was essentially a regular episode of Glee. They were right. The hour was comprised of the typical recent formula for this musical comedy: a significant majority of public service announcing, with a bit of teenage soap opera mixed in to get fans talking. A feud over how lame it was to sing in choir; an attempt at peace with the football players; a cliche-filled speech from Puck to recruit Karofsky and company back on to the field; a wholly unrealistic ending to the game (no team in gridiron history has lined up in shotgun formation with 11 seconds remaining and a lead); and then a random, unexpected kiss - with no build-up between the characters - to conclude the installment, leaving fans in our Glee forum to debate their favorite couples. All this said, I didn't even hate the episode. I haven't come to expect much from Glee in the way of plot development, except for the occasional eye roll over how much it feels to be preaching to its audience on a weekly basis and how lazy it can be in its storytelling (I said it from the outset: making Karofsky gay is a major cop-out in how to handle the issue of bullying). I mostly watch at this point for the musical numbers, and there was a nice mix on this episode (from an understated Puck/Rachel duet to the elaborate "Thriller" mash-up) and the quotes, of which there were also a few classics (who knew Brittany likes One Tree Hill so much?!?). That exchange practically made the episode on its own. It also opens up an intriguing storyline: how will Sue handle defeat? What did everyone else think? Are you invested in the ongoing Karofsky storyline? Or does it feel too obvious that he will eventually come out and make things right with Kurt? Also, sound off now: yay or nay on Quinn and Finn?